Gut-Biotic is the latest development from Veterinary Professional Services Ltd; this nutraceutical has been formulated using the latest science on the problems of obesity in horse s plus provide gut support for all horses in stressful situations. 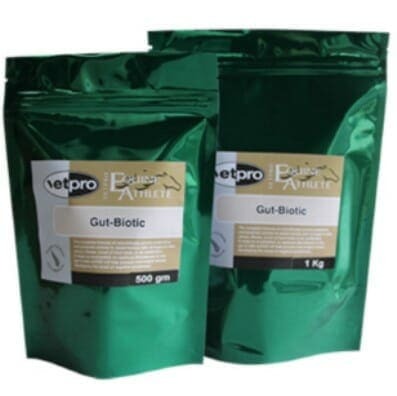 Vetpro Gut-Biotic contains Prebiotic and Probiotic actives that in line with the science will improve the horses gut microbiome to be restored and hence directly assist the health of the horse. The good bacteria in the gut f a horse are very important to the overall health of the horse. A horse is vulnerable to the changes that can occur in the balance and quality of that bacteria (called the microbiome), and that change will negatively affect the processing of food and therefore the well being of the horse. Changes can occur for many reasons, usually stress or illness related. Providing both a probiotic and prebiotic will assist with establishing a gut microflora at times when it may be naturally depleted by excessive workload, stress, long distant travel, changes in diet or grazing conditions, ill health and antibiotics. Also overweight horses if left unresolved, can develop Insulin Resistance (IR), which creates metabolic and health complications, such as Laminitis, EMS (Equine Metabolic Syndrome). Science has proved that feeding a short chained fructo-oligosaccharide does help reduce that possibility. Overweight horses to help prevent onset of insulin resistance and its consequences. Underweight horses to improve the gut flora to process food efficiently and aid weight gain. Horses in hard work and competition to help maintain good gut function under that stress. Horses that are unwell and especially those on antibiotics. Horses that show signs of diarrhea. Horses that are undergoing long distance travel. Horses that have to change their diet, especially change of grazing. Store in a cool dry place and always reseal the pouch after use.